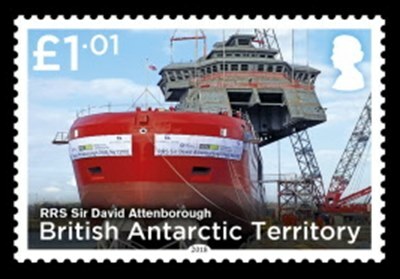 This stamp issue celebrates the construction of the Royal Research Ship SIR DAVID ATTENBOROUGH, the United Kingdom’s state-of-the-art polar research ship that will provide a new, modern platform for Antarctic and Arctic research. 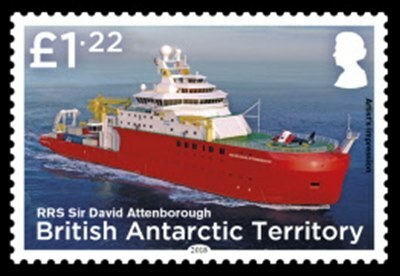 Named after the famous broadcaster and naturalist, the commissioning of the RRS SIR DAVID ATTENBOROUGH is part of a major Government polar infrastructure investment programme designed to keep the UK at the forefront of world-leading research in Antarctica and the Arctic. Commissioned by the Natural Environment Research Council (NERC), built to a Rolls-Royce design by Cammell Laird, the ship will be operated by British Antarctic Survey (BAS). This £200m commitment represents the UK Government’s largest investment in polar science since the 1980s. Launched by Sir David Attenborough himself and the BAS Director Prof Dame Jane Francis, the hull of the RRS SIR DAVID ATTENBOROUGH glided into the River Mersey on 14 July 2018. Days later, a 535 tonne superstructure was lifted into position on top of the hull. This block contains the final six decks of the ship and includes the bridge, helicopter hangar and accommodation for crew, scientists and support staff. Once operational, international scientists researching oceans, ice and atmosphere will have access to one of the most advanced polar research vessels in the world. The UK has been a world leader in polar exploration and research for over a century. Studying these remote regions plays a crucial role in helping us understand the changes in our planet’s oceans, marine life and climate system. 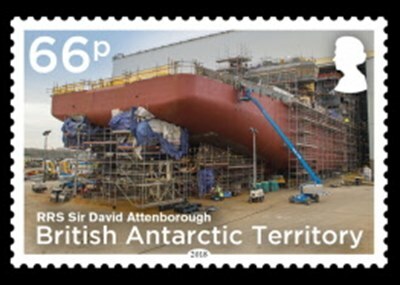 The RRS SIR DAVID ATTENBOROUGH‘s design optimises her ability to support science in extreme environments. A wide range of specialist scientific facilities, instruments and laboratories will enable scientists to conduct a wide range of multi-disciplinary sciences to study the ocean, seafloor and atmosphere. Data from the deep ocean and under-ice inaccessible locations will be captured using robotic and remotely operated devices. While the vessel may have become famous after a naming competition, the public’s choice of ‘Boaty McBoatface’ will live on in the guise of an autonomous underwater vehicle, which will be on board the RRS SIR DAVID ATTENBOROUGH and will be deployed on scientific missions. The new ship will operate year-round. She will spend the northern summer supporting Arctic research cruises and the austral summer in Antarctica carrying out research programmes and transporting people and supplies to BAS research stations. 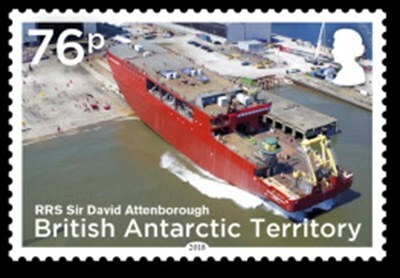 With her ability to spend up to 60 days at sea unsupported, and an ice-strengthened hull designed to break through ice up to 1m thick, the RRS SIR DAVID ATTENBOROUGH will undertake extensive voyages with significantly greater geographic coverage than her predecessors. British Antarctic Territory 2018 66p, 76p, £1.01, £1.22 sg?, scott?